Blended search, also known by the name of “Universal Search” or “Search 3.0”, is incorporating results from non-web sources (like books, videos and images) into the regular web search results. – Search marketers and businesses’ websites have more seats on first results page to “fight over”. Before “blended search” was born, websites could be shown on only 2 out of 10 results per page. Today, one can be shown on the same two seats from the past (seats that are reserved for the website’s pages, usually the homepage and some inner page) but also on other seats taken for social sites such as youtube (video results) or news sites (press releases). Basically, one can be shown on most if not all of first pages’ results (take Britney Spears for example). What is it Sad for? – Bad blogs and products results: Search engines don’t index these two very well, so blended search in this term is quite poor. So what will Blended Search bring? – Better and much more sophisticated statistic tools to track conversion rates out of different search results, such as video which is un-trackable at the moment. – Better and much more sophisticated SEM efforts: Traditional SEO will be nothing but complemental, while search marketing will focus on viral video, creating juicy (and highly optimized) press releases and so on. Do you see the future of blended search differently? This entry was posted on Tuesday, April 29th, 2008 at 8:40 pm and is filed under SEM, SEO. You can follow any responses to this entry through the RSS 2.0 feed. You can leave a response, or trackback from your own site. This is a pretty good overview of what universal search is and how it has (and will) change the search world. One point I think differently on is that traditional SEO will be more than just complimentary. By incorporating relevant results from multiple mediums you only increase the usefulness of SEO. What will change, though, is what the SEO experts will have to do to keep up. This will result in an SEO focus on sites such as Flickr and YouTube, as well as optomizing PDF’s and other documents available for download. As Google becomes smarter and returns more relevant search results, the SEO expert’s job will be to create and maintain more of that relevant content, no matter what media it is shown through. I for one am excited about where search, and SEO specifically, are going. 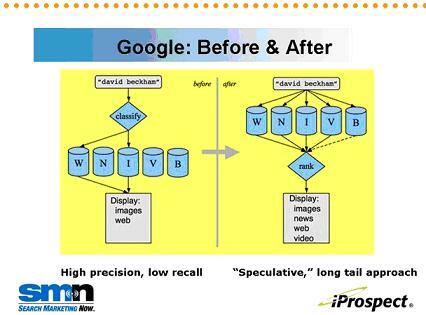 Thanks for your great summary of Chris Sherman’s webcast on Blended Search One Year Later – which we at iProspect sponsored. Perhaps your readers would like access to the iProspect Blended Search Results Study that was referenced within the webcast? If so, they are free to do so — or access the findings of any other iProspect search engine marketing study — with our compliments (don’t even have to fill out a form). * Kwegner – You are definitely right! (“SEO expert’s job will be to create and maintain…no matter what media it is shown through”). This is the reason why I still can’t get enough of SEO. You need to keep up with the world of search’s changes. Yam! * Bill – Thank you Bill! Iprospect study is truely valuable. Yes sir. You commented on an article of mine titled The Top 12 SEO Firefox Extensions. I think you and I are on the same page with SEO…my passion for it keeps growing day by day because it is so dynamic, while most people get frustrated by such a fluid field.